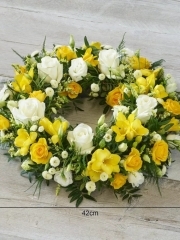 In the sad event of losing a loved one, we at Aberdeen Flowers understand that planning a funeral can be difficult which is why, once your order has been placed, we will take care of everything for you. Although a funeral is a sad occasion, it is also a time to celebrate the life of the recently deceased which is why presentation is understandably very important. This is where our selection of funeral arrangements come in: we have several collections of expertly designed floral works including casket tributes, sprays, posies and baskets. 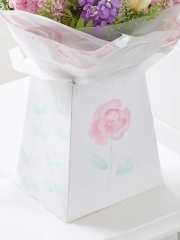 The posy and basket collection on offer includes arrangements in lilacs and pinks as well as yellows and whites however, if these colour schemes are not to your full liking, you are able to create a bespoke arrangement. The bespoke service gives you full artistic control over your order as you can specify what flowers, colours, arrangement type and so on. If you’re not entirely sure as to what you would like, you can get in touch and have a chat with one of our florists. Aberdeen Flowers have over forty years of experience in the floristry industry meaning our florists are all knowledgeable and would be able to offer the right advice. You can get in touch either by phone on 01224 633968 or alternatively, you can send us an email or even pop by our shop in Aberdeen. Alternatively, you can leave your arrangement up to the florist’s choice and the talented Aberdeen Florists will arrange something beautiful for your specific occasion. No matter what it is you’re after, the team here will always do everything possible to provide you with nothing but the best. All the flowers the Aberdeen Florists use are fresh as we receive over four flower deliveries per week from our suppliers. 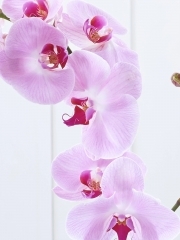 We source all of our flowers from Holland as Dutch flowers are renowned worldwide for being the best. Not only is the quality good, but the flower stands are always stocked with an abundant variety of flowers. We have various lilies including the Oriental lily and Asiatic lily; we have roses in different colours including reds, white, cream, pink and yellow; Alstroemeria; chrysanthemums and lisianthus to name a few. In addition to beautiful flowers, our Dutch suppliers also provide us with premium quality foliage which is important as this fills the arrangement and compliments the flowers. The quality of flowers combined with the experience and talent of our florists ensures that Aberdeen Flowers will always provide nothing short of perfection. We will deliver your funeral flowers on your behalf if you prefer. Our delivery drivers are experienced with handling flowers, driving carefully on the road to ensure that your flowers aren’t damaged and arrive in the same condition they leave the shop. Furthermore, Aberdeen Flowers is a member of Interflora, an international network connecting hundreds of flower shops worldwide. This means if you would like to send funeral flowers somewhere else in the world, whether it be in a different city or country, we are able to do so. For example, if you would like to send some sympathy flowers to grieving loved ones abroad, we have you covered. Our number one aim at Aberdeen Flowers is to provide you with a service that goes beyond any other flower shop which is why we will always endeavour to fulfil all your floral wishes.